It’s one thing to buy a good lock. It’s another thing to use it correctly. Honestly, if anyone really wants your bike they will take it. However, locking up your bike securely will put off that person who just wants a ride home or something to sell. At the very least it may just persuade them to steal a less secure bike because it’s easier. 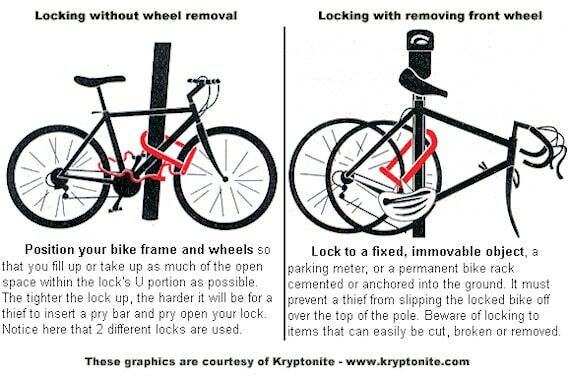 Lock your bike to a secure, immovable object. Trees and certain pieces of street furniture don’t make particularly good locking locations; trees limbs can be sawed through, and your bike can often be lifted over bollards and signposts. 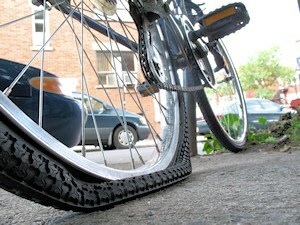 Your wheels are the most vulnerable part of your bike. 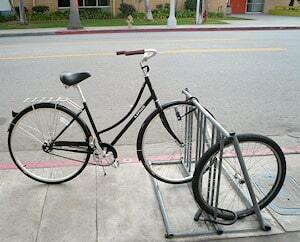 Make sure that your lock goes through both wheels and the frame, or use two locks: one for each wheel. 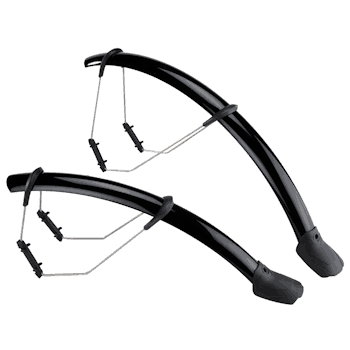 Alternatively you can invest in a locking wheel skewer for your front wheel. It doesn’t take long to steal a bike. Make sure that you lock your bike up properly whether you are leaving it for 30 seconds or half an hour. 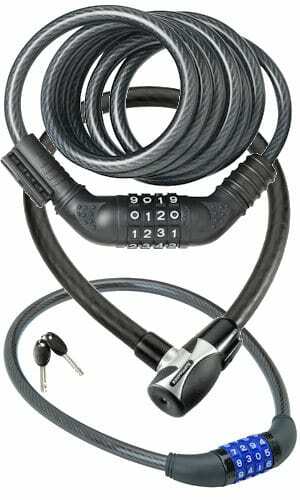 Bike lights and other items and accessories that are not secured to your bike are easy pickings for thieves. Take them with you whenever you leave your bike. No matter how safe you feel in your home, your bike is still at risk, especially if it’s in your garage or your shed. Lock it up at home like you would if you were on the street. Not all bike locks are cheap, but you really do get what you pay for. If you treasure your bike, buying the best locks that you can afford would be a wise investment. 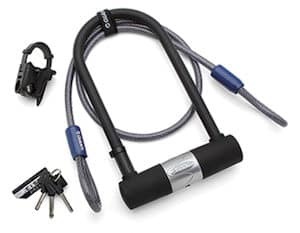 A U-Lock – Some come with an extension cable<[/caption] If you come back to your bike and it’s got a mysterious puncture or damage, walk it home. It’s probably been marked in the hope that you’ll leave it there overnight. Consider using a registration service, to physically mark your bike with an identifying feature and link it to your identity on a database. Some towns and police departments offer free solutions, and there are alternatives. If it does go missing you must report it. The police will only take bike crime more seriously if they have reason to do so. If you’re down to one lock, or are particularly worried about the security of your wheel, taking your front wheel with you eliminates half of the risk of theft immediately. Use secure bike parking wherever possible. Even for a price, your bike will be far better protected from theft inside a designated secure location rather than on the street, no matter how well you think you’ve locked it up. Make sure that you lock your bike up in as public of a place as possible. 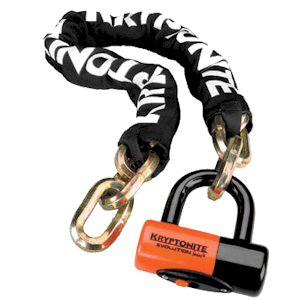 If you leave it in a secluded location, it will give any would-be thief time to work on your lock undisturbed. Make the lock mechanism itself hard to access. For example if you’re locking your bike to railings, point the lock mechanism away from the street so it’s harder for a thief to attack. Don’t leave space in your shackle – any extra space gives evil bike stealing tools the room they need to do their dirty work. Don’t give them that opportunity. If you’ve taken out insurance on your bike don’t buy any old lock. Make sure that the locks that you have purchased are featured on your provider’s approved products list as some insurance companies insist on their use. But most importantly, wherever you’re going, please do not forget your lock! 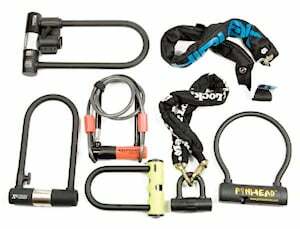 Halter’s sells a range of locks from Abus, Blackburn, Knog, Kryptonite and other good manufacturers. Let us advise on what’s right for you. Halter’s don’t just sell new bikes. We also take care of your trusty bicycle. Anything from fixing a flat to programming your electronic gears, adjusting your brakes to a full overhaul. 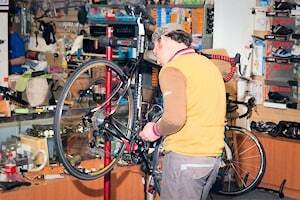 We service and repair bikes from beach cruisers to full-suspension mountain bikes, hi-tech triathlon machines to cyclo-cross bikes and your trusty hybrid bike or commuter. We are delighted to look after any quality bike produced by a reputable manufacturer – we have a list here – and sourced from an independent bicycle dealer or produced by custom frame builders and designers. This adult Bike-Shaped Object – BSO – cost $140 in the toy department of a big box store – why? However, we reserve the right to refuse to service or repair bicycles purchased from big box and discount retail stores. These bicycles – Bike Shaped Objects – are often built to lower standards and use non-standard parts and components. 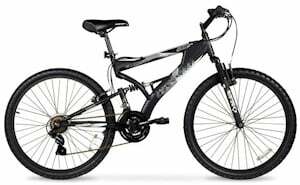 We are not able to warranty that any possible repair or adjustment to this type of bicycle is either safe, reliable or economic. This bike, from a reputable manufacturer, cost $3000 from an independent bicycle dealer – why? You can find out more about Bike Shaped Objects here. Lastly, time moves on, unfortunately, and it’s been over three years since we published our last workshop tariff. You can find details of our new tariff here although any menu cannot anticipate every circumstance. Naturally, we will call you should we find issues which go beyond our original quote/estimate. Workshop turnaround is currently down to a few days, but take advantage of our quiet season – November to March – and get your bike in for its annual service. For sure, in April or May you will want your bike for tomorrow’s first ride of the season and find yourself waiting a week plus. 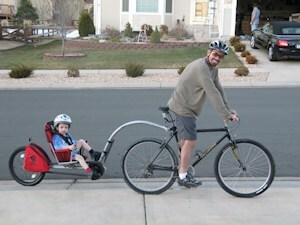 Taking Junior along on your favorite ride is one of the great pleasures of cycling. 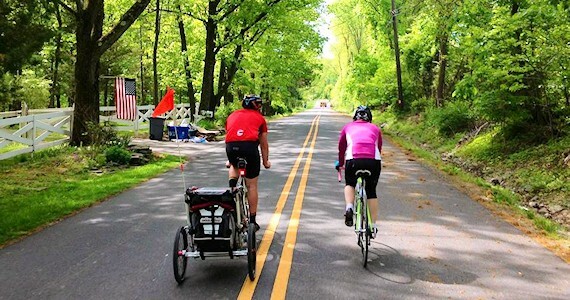 A number of adaptions and accessories enable you to safely transport baby with your bicycle, and some even allow them to put in some effort of their own to maintain forward progress. 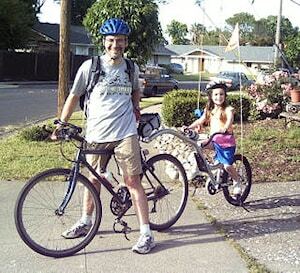 The most common solution for most bikes is the rack-mounted child carrier. 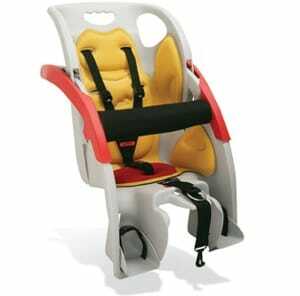 A seat like this can carry a child up to 40lb/18kg. Your child should also be old enough to support his/her own head and realize the importance of wearing a helmet. Most child seats can be quickly removed from the bicycle when it’s not needed and has a number of safety devices to ensure security on the bike. There are a couple of types of bicycle which are not suitable for a rear carrier so check your bicycle is suitable to fit this type of seat. Full-suspension types are not possible and cruiser-type bike are often problematic. We are frequently asked about front mounted child seats, but currently we have not come across any design we would be happy to put our own children on. So, inevitably, children will grow, or you need to transport two of them. What then? 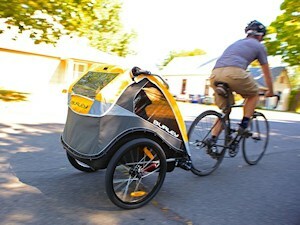 Bike trailers are a means of carrying up to two children, or a dog or other cargo for that matter. A typical trailer will transport around 100lb/45kg, but check individual models for exact capacity. The Wee-Hoo – make ’em work! Some models can also be adapted to strollers or even joggers, usually with the addition of a conversion kit. Often children want to feel they’re making a contribution so find the Wee-Hoo exciting to ride. The trailer can be adjusted to suit most children, even older/larger children who may have mobility or other issues. Finally, for children who are free-riders but would find any distance difficult on a child’s bike there is the Trailer Bike; half-a-bike which is also attached to the adult cycle. This type of trailer also enables the parent to have a sense of security and control when cycling with younger children on the road or in busy areas. 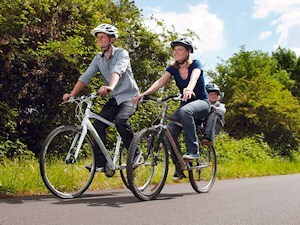 Versions are available with gears, and even a 2-child tandem version to enable a true family pace-line. Halter’s stock a range of children’s transport adaptions from Burley, Co-Pilot, Wee-Hoo and Giant. Come in and ask our advice. Let’s be clear about flats. Flat tires, that is. Never a day goes by in Halter’s when we don’t fix at least a dozen flats. And hardly a day goes by when we’re not asked what the warranty is on a flat fix. Well, of course we warranty our flat fixes. Well, again we’ll fix it, charge you the going rate and warranty that fix, but not that you won’t flat again even by the time you’ve rolled the bike out to your car. Believe me, your tire is under attack from the moment you roll it out of the shop and then any puncture is just down to The God of Flats or lack of awareness and maintenance. When a customer brings in a bike or wheel in need of a flat fix we always check the damaged tube and tire for evidence of how the puncture occurred. A single pin-hole – sorry, there really was a bit of wire or tack in your drive or even in your garage. We don’t prick a hole in your tube just to make extra business. There’s no money in fixing flats. Really! A “snake bite” – two holes typically caused by running tires under-inflated or running the wheel into the ground. Offspring says s/he didn’t smash the wheel up the kerb? Really? 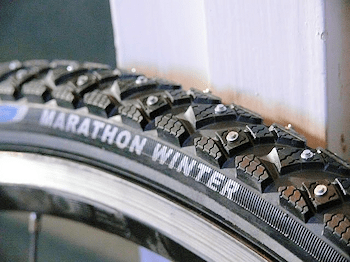 Tear around the valve stem – careless inflation though poor technique or the wrong pump. Inferior quality wheel with built-in sharps including poor welds, untrimmed spokes, poor quality rim tape. 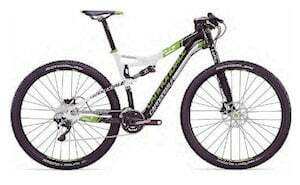 Buy a quality bike from your local independent bike store!!! We nearly always explain the evidence to the customer. But sometimes it is just bad luck. However, you can minimize the risk of getting a flat by ensuring your tires are correctly inflated before every use and checking your tires haven’t gathered any shards of glass, flints or even wire from vehicle tire debris after every ride. And watch where you’re steering … if you ride in the gutter you’re going to pick up all sorts of problems. 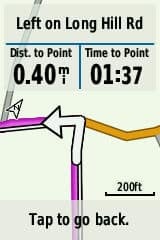 Apart from being able to display a real-time map on screen, the Garmin Edge 810/800 has another useful talent, the ability to display turn-by-turn instructions so you can follow pre-planned routes. 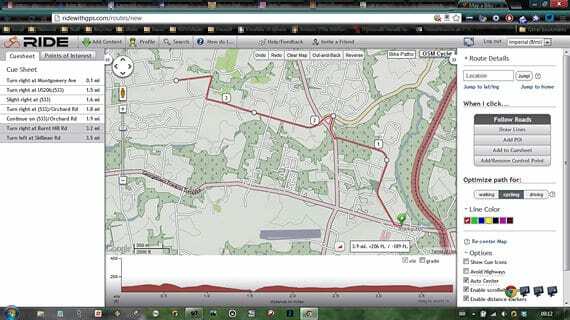 There are a number of bike mapping and route planning websites. 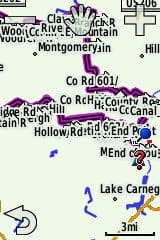 I’ve found ridewithgps.com to be a good one. Just register and start planning a route. 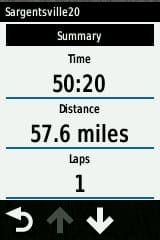 It will then compile a printable cue-sheet for if you don’t have a compatible GPS unit and a .tcx file for uploading to your Garmin 810 which can be used for turn-by-turn display. 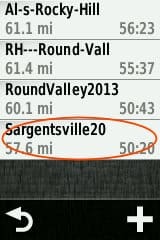 While planning and plotting your route make sure you use the correct website settings. Most will have options for walking/cycling/driving and whether to follow roads and other refinements. 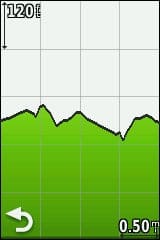 I like ridewithgps.com’s option to use the OSM Cycle Map which has extra information appropriate for cycling. 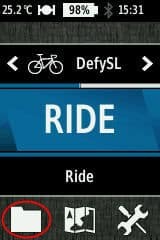 Once you’ve saved your route you will have a number of options on how to export it. 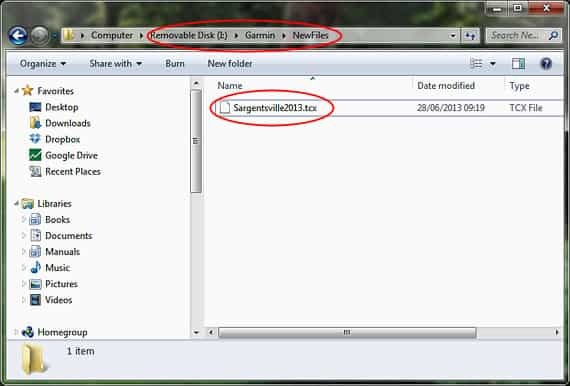 Download the .tcx file, then copy it into the New Files folder on the MicroSD card in your Garmin. 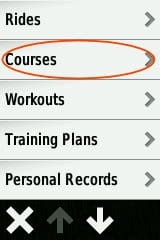 I’m assuming by this stage you’ll be familiar with how to use your computer’s file explorer to do this and that you have already set your Garmin to use the card for data recording … see this if you’re not familiar with the Garmin 810/800. 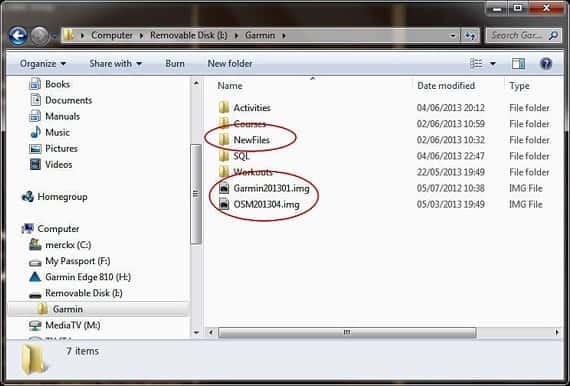 On removing the Garmin from your computer and turning it on, the unit will read the file in the NewFiles folder and process it and leave it as a .fit file in the Courses folder. Please post questions, points and any other helpful advice in the Comments box below.